Now that "busy season" at my office has reached its conclusion, I thought I would take this opportunity to share with you one of my favourite subjects to photograph: birds. While Hamilton is easily dismissed as an industrial town, there are many green spaces to enjoy with your family. On a suggestion from a friend, I moved slightly out of the boundaries of Hamilton to attend a "Raptors in Focus" event at the Mountsberg Conservation Area. The Mountsberg Conservation Area is located in Campbellville and is easily accessible from Highway 401 (if you are coming from the GTA) or Highway 6. One of the main features of Mountsberg is the Raptor Centre. At the Raptor Centre, employees and volunteers of the Halton Conservation Authority care for various raptors that are no longer able to be released back into the wild. Many raptors are in care at the Centre and include owls, hawks, eagles, and falcons. 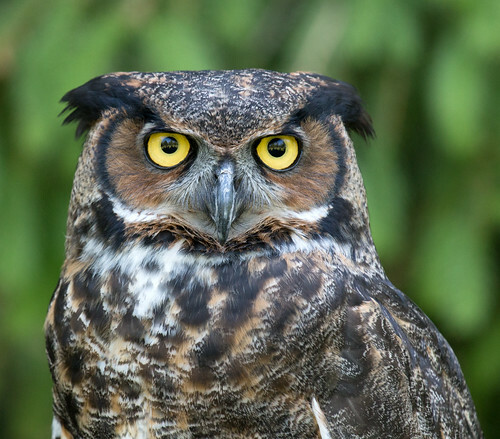 One of the more frequently appearing raptors, is a Great Horned Owl named Octavius. The Raptor Centre holds various events to promote awareness and education of various birds of prey. 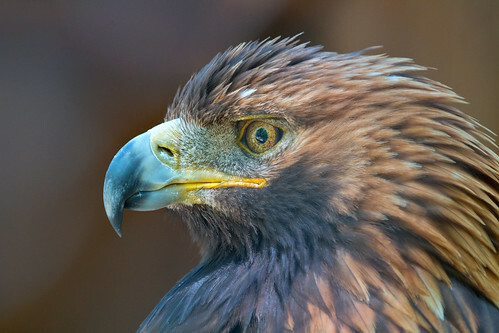 Available with general admission to the park is access to the Birds of Prey shows. These occur regularly on the weekends at 12 p.m. and 2 p.m. and at varying times during the week (depending on whether school is in session). For those that are a bit more brave and have a few extra bucks, you can have a more private show by booking a Raptor Encounter. The Raptor Encounter allows you to have a personal introduction to some of the birds at the Centre. You may be able to experience some training or even hold one of the raptors! On a monthly basis, the Centre holds a Raptors in Focus event. For a small fee, up to fifteen photographers can engage in a private photo shoot. During the hour-long event, four raptors are brought out and perched in a easy to photograph position. I attended two of these events this year. The first on March 29 and the second on May 31. It was a great experience and I believe that the results speak for themselves. While it was quite cool (okay, freezing) in March, the surroundings were quite picturesque and allowed for great contrast between the bird and the background. The weather was much more friendly on May 31 and allowed for some more exploration of the park after the event concluded. If you ever wish to attend a Raptors in Focus event, I recommend bringing a DSLR camera with a telephoto lens of around 200mm or more. A tripod is not necessary but may be advisable if you use a heavier lens. A shameless plug, but you can see more of my Mountsberg photos on my Flickr page. There are plenty of other activities to enjoy at Mountsberg which include observing the bison, watching the nesting birds from the blind at the reservoir, attending the maple syrup event, enjoying the surroundings, etc. I hope that in reading this post, you feel a bit more inclined go out and enjoy more of what nature has to offer. Don't forget to share some of your photos, too! Feel free to use the linky below. 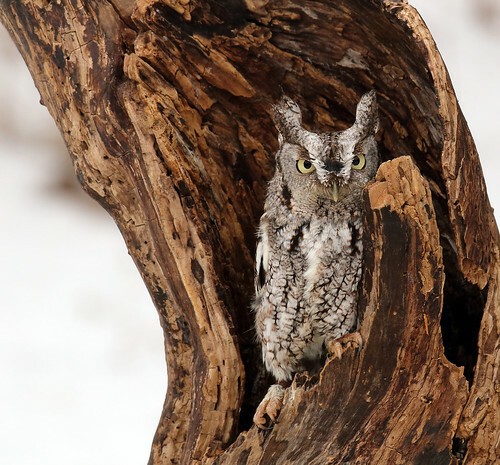 I love the owls, they are so curious,little screech owl is darling and my husband loves the Eagle!!! What a great thing that they do to help take care of these birds. Agreed. Such majestic animals that live right in our backyard! oh wow that's some great shots of the beautiful birds! Thanks, Cathi! I have one talented brother. I would love to see the Owls and Eagles! So beautiful! I got to pet an owl last year through the City Critters program at Toronto Botanical Garden but I have yet to see an eagle up close. Beautiful birds! Thanks for sharing. Have a great night. Thanks for stopping by, Cascia! LOL! I've been using the word 'majestic' a lot myself! Amazing bird shots. Thank you for sharing them. Thanks Bailey! Glad you could stop by! Beautiful pictures. I've been going to Mountsberg for years but I didn't know about the private Raptor Encounters, very happy to hear about them. It's such a wonderful facility and a really good way to spend a day. You have? This is the first time I've heard of the place. I'm thinking if my brother goes again in the summer, I might have to join him. It's been a few years since I've been there. Really? I hadn't even heard of the place until my brother shared this post. I hope to go sometime this summer. All of the birds have the most fantastic names. Love! Yeah, my brother did a really great job. What a beautiful way to spend the day. Such beautiful pictures. I think I need to start spending more time looking at Conservation Park signs on the highway and leaving time for detours! Love the pictures, beautiful animals! This place sounds like a hidden gem. The stereotype of Hamilton as an industrial town is unfortunate as I never would have thought to look for outdoors/nature type activities in that city.